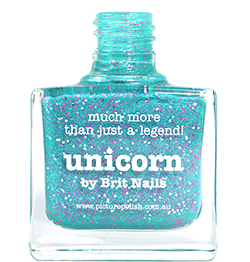 Barry M have released a whole host of new nail paints for Autumn/Winter 2014, and I'll be showing them to you over the coming days! I'm starting with the two new additions to the Aquarium collection (reviewed here back in March) because I just couldn't wait to try that purple! I'm a big fan of the original Aquarium collection, Barry M proved that they could do great quality duochrome on a budget. I always hoped it would be added to, and what better than a purple? Persian is a shimmering purple base with a pretty gold colour shift, the strength of which depends on your light source. The formula here is very easy to apply, a little thin as duochromes are. As I did with my original swatches, I've applied the colour over a plain black creme base - if you do it that way, you'll only need one coat of colour, compared to 2 or 3 if you wear it alone. I've used 1 thick coat of Persian over Barry M Black, with top coat. 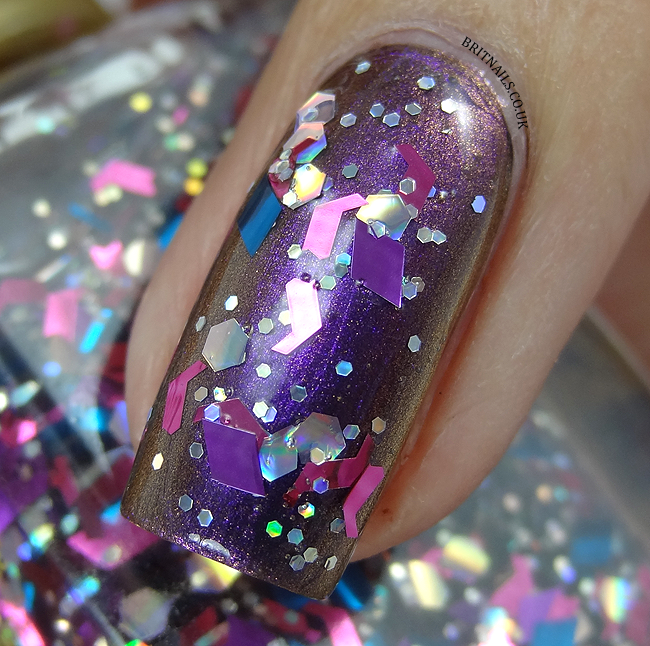 Atlantis is the new glitter topper released alongside Persian. It's different from the glitters in the original collection - instead of shards, we've got hexes, diamonds, irregular shapes (the pink pieces are not something I've ever seen in polish before!) and a smattering of tiny hexes. I do love the colour combination of pink, purple, blue and silver, but it seems a lot more sparse than the originals. I've used 1 coat over Persian (with a bit of dabbing to fill gaps) but as you can see, it really needs some placement! It also needs quite a thick top coat to tame it down. Persian is a beautiful addition to the Aquarium family (I am a sucker for purple and gold together) and Atlantis is a super pretty glitter, but just a bit too sparse for my tastes. These both look gorgeous, I'll definitely be picking them both up! Totally going to need Persian. I adore duochromes. 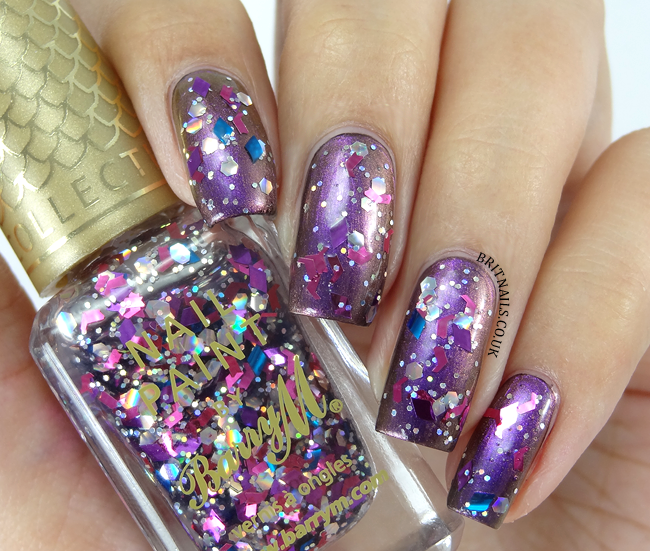 Can't wait to see your swatches of the entire new nail color range from Barry M!